In 1974, Laws Stained Glass Studios installed (35) leaded, hand-stained glass windows at First Baptist Church in Auburn, AL The eleven main sanctuary windows (size 60" wide x 168" high with a round top) and five shorter windows ( size 60" wide x 120" high) each contained large shield-shaped medallions with symbols. Three window (size 60" x 120" high) were hand-stained pictorial windows which had full scenes of "The Nativity", "The Good Shepherd", and "The Resurrection" depicted. All of the windows and symbols were designed by Laws' artist Paul Gentry. Thirteen windows (size 38" wide x 60" high) did not contain artwork. Also, three door transoms (size 60" wide x 32" high) were made. All of the windows were installed into the existing wood frames. 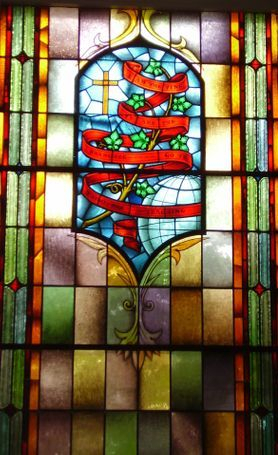 In 2010, Laws Stained Glass Studios provided four hand-stained glass windows (size 28" wide x 62" high) with no artwork. These were installed into the existing wood frame, and 1/4" Lucite acrylic was placed on the outside as the protective covering. 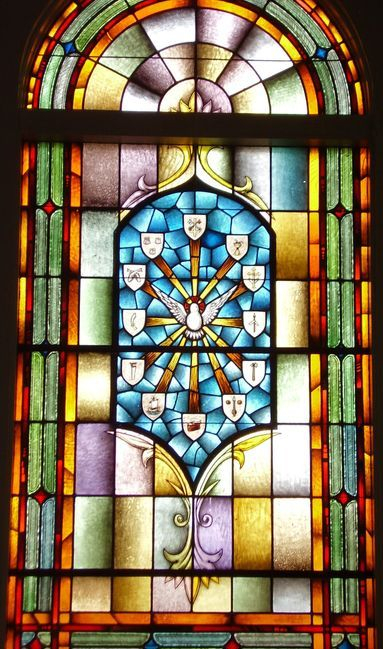 In 2011, Laws provided another hand-stained glass window (size 18" wide x 67" high) and 1/4" Lucite acrylic. Hand-stained pictorial glass window of "The Good Shepherd"
Hand-stained pictorial glass window of "The Nativity"